Following on from the partnership signed last year at the 13th United Nations Congress on Crime Prevention and Criminal Justice, UNODC and the International Centre for Sport Security (ICSS) have today unveiled a new resource guide that will help law enforcement and sports organisations better detect and investigate match-fixing and cases of sports-results manipulation. Over 40 international integrity experts contributed their knowledge to the development of the resource guide. These include officials from FIFA, the International Olympic Committee, INTERPOL, the European Commission, Hong Kong Jockey Club, World Snooker, Council of Europe, Ministries of Justice from France and the Republic of Korea, and EUROPOL. 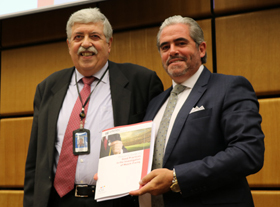 Speaking at the launch of the resource guide, John Brandolino, UNODC Director for Treaty Affairs, said: "The problem of match-fixing is such that it undermines integrity in sport with the significant illicit profits it generates allowing organized crime and corruption to thrive. In addition, the investigative skills of both law enforcement agencies and sports organizations around the world which are needed to identify and apprehend those responsible, are relatively underdeveloped." Delivering remarks on behalf of Mohammed Hanzab, President of ICSS, Emanuel Medeiros, its CEO for Europe, while highlighting the expert contributions in the development of the guide, mentioned that this handbook provides a comprehensive range of case studies, investigation techniques and approaches to combat match-fixing as well as providing valuable guidance on how to disrupt the international organized crime syndicates that now operate in sport. Themes covered in the guide include: co-operation between law enforcement and sport investigators; sources of information, allegations, intelligence and evidence; evidence and interviewing; why match-fixing is an International Issue; application of existing legal instruments, such as the UN Conventions against Corruption and Transnational Organized Crime; relationship between investigators and prosecutors in a criminal or sporting case; and alternative and complimentary approaches to combat match-fixing. UNODC and the ICSS will look to develop the resource guide into a series of workshops designed to build capacities of investigators, prosecutors and relevant officials in sports organizations on how to investigate allegations of match-fixing.